The temple and temenos were cleared to a depth of 12 metres and notes that the temple may have been established in the 12th Dynasty but was altered throughout its existence. A gold statuette of Hershef was found and left Egypt in exchange for some 1st Dynasty jewellery from Abydos. A granite triad of Ramesse II, Ptah and Hershef was retained by the Egyptian Museum in Cairo. Petrie notes clearing burnt houses from the Roman Period with the following objects found: lamps, terracotta figurines, pottery, and coins. Currelly located the cemetery and notes the graves as looted. Petrie reports that he purchased many things this season in order to complete a corpus of lamps and presumably also bought other material. Petrie, W. M. Flinders 1904. Excavations at Ehnasya. 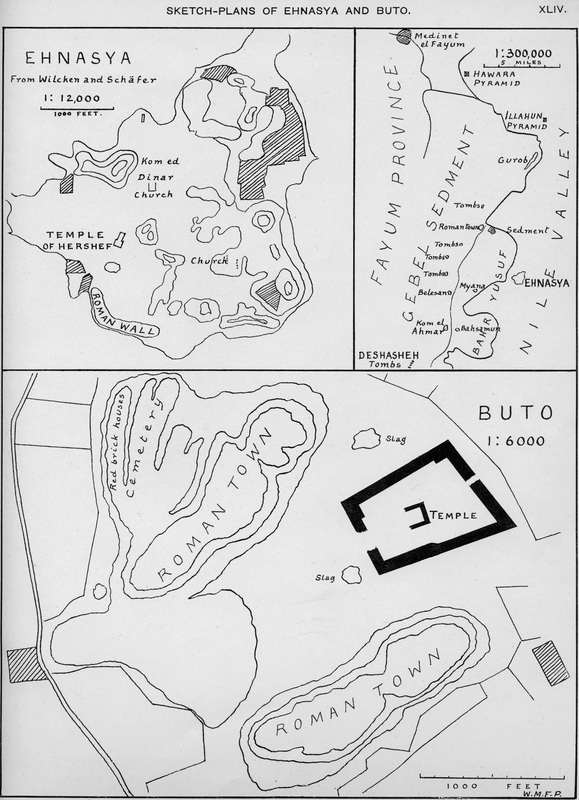 Archaeological Report (Egypt Exploration Fund)(1903-1904), 12-14. Petrie, W. M. Flinders 1905. Ehnasya: 1904. Memoir of the Egypt Exploration Fund 26. London: Egypt Exploration Fund.